Wall Street failed to extend its win streak to seven days on Wednesday as investors took their feet off the gas. The Dow Jones industrial average and S&P 500 posted minor losses while the Nasdaq landed solidly in the red (down 0.83%) amid more biotech struggles. The weaker-than-expected housing numbers led investors to sell shares of home builders such as Lennar (LEN) and KB Home (KBH). Stocks related to home construction also took a hit, including Home Depot (HD) and Owens Corning (OC), which makes insulation products and roofing shingles. In deal news, SodaStream International (SODA) popped 11% after an Israeli paper said Starbucks (SBUX) is in advanced talks about taking a 10% stake in the household soda-machine maker. Starbucks fell 1% on the report, while Keurig Green Mountain (GMCR), a rival to SodaStream, shed more than 4%. Investors are sifting through the latest quarterly results to get a better feel for the health of companies and the broader economy. Tech stocks were the big focus after the closing bell this evening. Mark Zuckerberg's Facebook (FB) enjoyed an after-hours bounce by posting a 72% surge in revenue. The social media giant's earnings significantly topped forecasts from analysts. Powered by solid iPhone sales, Apple (AAPL) beat Wall Street's earnings and revenue estimates and also unveiled a $30 billion increase to its share buyback program and hiked its dividend. The tech behemoth also reiterated plans to launch new product categories and unveiled plans for a seven-for-one stock split in June. 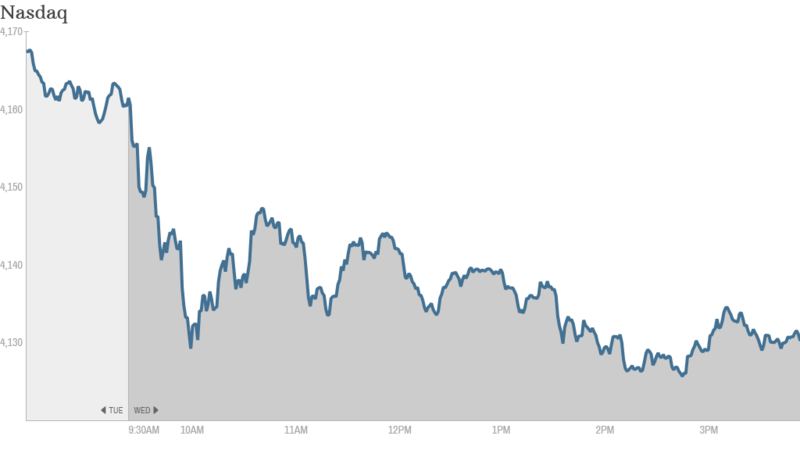 Apple stock was down more than 1% Wednesday before its earnings release. "Sentiment in some of these tech names has gotten a bit bubbly going into numbers. That's dangerous," said Michael Block, chief strategist at Rhino Trading Partners. Investors poured cash into Dr. Pepper Snapple Group (DPS), driving the beverage maker 4% up to an all-time high after the company announced strong profits. Other companies having a happy Wednesday included Dow Chemical (DOW), which reported a double-digit increase in net earnings per share compared to this time last year. Aircraft maker Boeing (BA) flew higher after exceeding profit forecasts and announcing an 8% revenue increase. Both stocks closed higher. Procter & Gamble (PG), a producer of household consumer goods like Crest, Tide and Gillette, also had solid quarterly gains, although its stock fell slightly. Despite bad weather that caused thousands of flight cancellations, Delta Air Lines (DAL) beat expectations with soaring profits. Investors bid up the airline 6% to an all-time high on the upbeat results. A lot of the market decline Wednesday was driven by results that came out late Tuesday, especially from biotech companies. Gilead Sciences (GILD) shares rose 1% after it blew past earnings estimates. "$GILD Getting it's mojo back - slowly but surely," said stocktwits user StockOptionPro. On the other hand, Amgen (AMGN) failed to live up to analysts' expectations and is one of the biggest losers today. The biotech sector has taken a beating in recent weeks and was leading the Nasdaq lower on Wednesday after Amgen's miss. The tech sector was also dragged lower by selloffs from EMC (EMC) and Juniper Networks (JNPR) following their quarterly results. Shares of Yum! 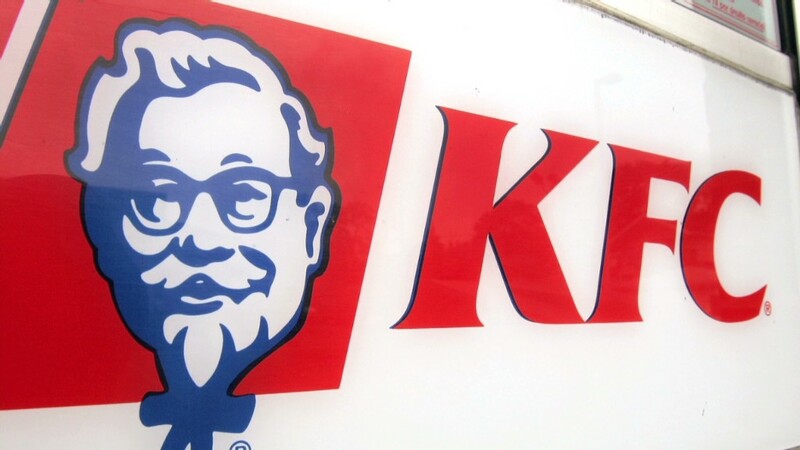 Brands (YUM) fell 1% even after the parent of KFC and Taco Bell beat earnings expectations with especially good growth in Asia. They have also announced the return of the infamous KFC "Double Down" sandwich. U.K.-based chip designer ARM Holdings (ARMH) -- part of the CNNMoney Tech30 Index -- reported record revenue and profit in the first quarter, but results were slightly weaker than analysts were expecting, sending the stock down 2.75%. European markets closed modestly lower.